Nail & Staple Gun Cordless Electric Heavy Duty Precision Stapler Nailer 18V&##xA0. The T-Mech 18V Cordless 2 in 1 Nail and Staple has extensive capabilities; nail/staple into plywood, hardboard, cardboard, wardrobe backing, picture frames, fencing, roofing, carpeting and underlay, blinds, fabrics and upholstery, ceiling tiles, plastic sheeting, or general craftwork. No matter what your project is, the T-Mech Nail and Staple Gun won&###x2019;t let you down. Charged by a powerful 18V 2000mAh Li-Ion battery, the Nail and Staple Gun is fully charged in just 50 minutes. From there, fire away at a speed of 60 nails/staples per minute! Choose between Single Fire or smooth and continuous Contact Fire for added speed and ease of use. Built-in Air Impact design and Depth Adjustment gives you dynamic control and precision placement whilst the two-part safety feature protects against misfire or accidental use. With 300 x FREE nails and 300 x FREE staples, you&###x2019;ll be up and running in no time. The large magazine (which holds up to 100 nails/staples) further reduces downtime, so you can give your project the time it deserves. Choose between 1 or 2 batteries and ensure that you are never out of power! Take advantage of the superfast Li-Ion batteries charging time and you will never have to worry about down time again! Feel the power in your hands with the ergonomic handle and moveable cordless design now! 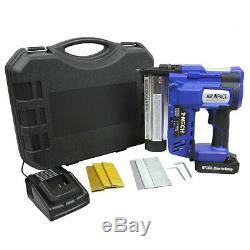 Powerful, heavy duty 18V Cordless 2 in 1 Nail and Staple Gun. 300 x FREE nails and 300 x FREE staples, you&###x2019;ll be up and running in no time. Depth Adjust for precision placement. Single/Contact fire option results in 100 nails/min. LED Indicator informs you of dryfires/jams. Choose between one or two Li-Ion long-lasting battery and charger with a rapid charge time of 50 minutes. Battery: 18V 2000mAh (2Ah) Li-Ion Battery. Magazine Capacity: 100 nails or 100 staples. Length of nails: 50mm/18 gauge brad nail. Length of staple: 40mm/18 gauge light duty staple. Dimensions: 28.5cm (H) x 27.4cm (W) x 9.6cm (D). PRICE: &###xA3;119.99 to &###xA3;139.99. 28.5cm (H) x 27.4cm (W) x 9.6cm (D). 18V 2000mAh (2Ah) Li-Ion Battery. 100 nails or 100 staples. 40mm/18 gauge light duty staple. UK Mainland orders placed by 2pm are dispatched on the same day. Orders placed after 2pm Friday will be despatched on the Monday. Scottish Highlands, Channel Islands and Ireland. The 30 days start from the day after you receive the goods. Monster House, Alan Farnaby Way, Sheriff Hutton Industrial Estate, Sheriff Hutton, York, YO60 6PG. The item "Nail & Staple Gun Cordless Electric Heavy Duty Precision Stapler Nailer 18V" is in sale since Wednesday, October 24, 2018. This item is in the category "Home, Furniture & DIY\DIY Tools & Workshop Equipment\Hand Tools\Other Hand Tools". The seller is "monster_mechanics" and is located in York. This item can be shipped worldwide.